I could have backtracked thru Mozambique to get back to South Africa, but that didn’t sound nearly as fun as cutting thru Zimbabwe and having the chance to visit the county’s medieval namesake. Great Zimbabwe is thought to be one of the most advanced civilizations in Africa during the middle ages, and it was continually inhabited until the 15th century with as many as 18,000 residents. Today you can walk around the ruins, the hill top fortress, and wonder what it must have been like to live there in its heyday. I was in near the Zim border on the Mozambique side in Chimoio with a Dutch backpacker named Tess, and we wanted to make the 350*km trip in one day. It was a Sunday, which means fewer ‘chapas’ (buses) that don’t fill early, but we were lucky enough to be on the road shortly after 7. The bus we were on said it was going to the border, but stopped one village short of it and shyly asked us to take another bus. We met an American doctor at our hostel in Chimoio who had been through the same border a handful of times. She had no idea how much the visa would cost, since it ranged from $30 to $80 depending on when and who crossed, but once she got thrown into jail for under-staying her visa. She said she would stay the weekend in Zim, but came back a day early, and they charged her with ‘fraud.’ 20-some odd days later, she bought her freedom from a guard for $5, who simply left her door open and she walked back to Mozambique, without any belongings, or a passport. I’m still not sure how or why something like that happened, or how she got back into Mozambique, but I intended on buying my visa on arrival for the exact amount of days I needed. We crossed the border 3 hours later, with a $30 visa, and had to make 2 more connections. First we went to the bus station at the border town Mutare, and bought our $8 tickets to Masvingo. It’s strange how much more expensive Zimbabwe is than Mozambique, especially since its one of, if not the poorest countries in Africa (according to the Africa Wealth Report and Global Wealth Report in 2015-2017). Zimbabwe used to be one of the richest countries in Africa, as recently as the year 2000, with tons of gold reserves still unexploited, but after a whole lot of corruption and inflation, the local Zimbabwean money in million and billion dollar notes had to be traded out for the US dollar. They have print money and coins that are different, but it’s the same value, and even the locals don’t trust them so they prefer US bills. From Masvingo, we took a shared taxi the last 25 km to Great Zimbabwe, and though we didn’t expect great things for accommodation, the so-called ‘hostel’ they had there resembled more closely a prison bunk. The bathrooms were fitting to the theme; the toilet stalls had no doors, but I did walk thru a spiderweb to get to it, and the showers were simply pipes that opened from above. I couldn’t brush my teeth in the sink because 3 massive bugs that looked like a hybrid of queen bees and swollen termites were still scrambling for their lives to get out of the slippery basin. Great Zimbabwe itself was, to my relief, still worth the trip, even with the shanty accommodation. 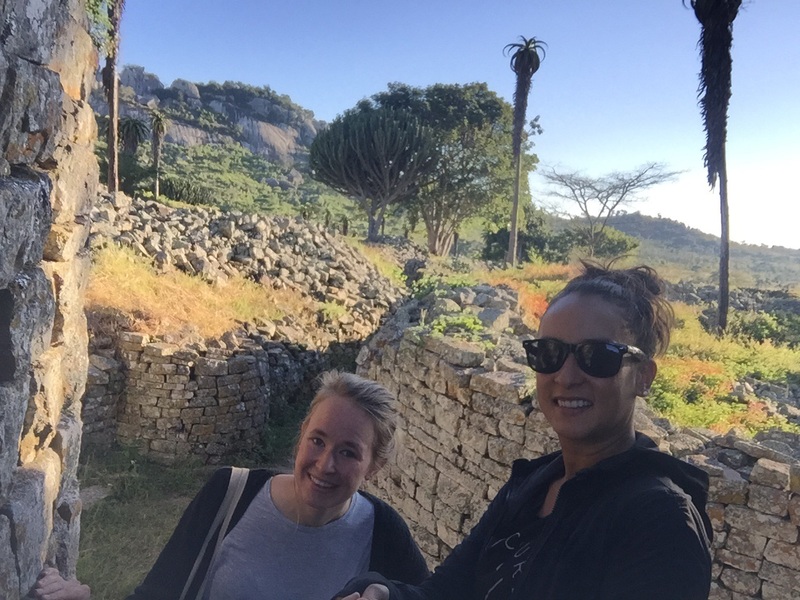 Tess and I watched the sunset from the fortress, shared with a group of animated baboons, and got back up at sunrise to explore the various ruins and relics many-hundreds of years old. 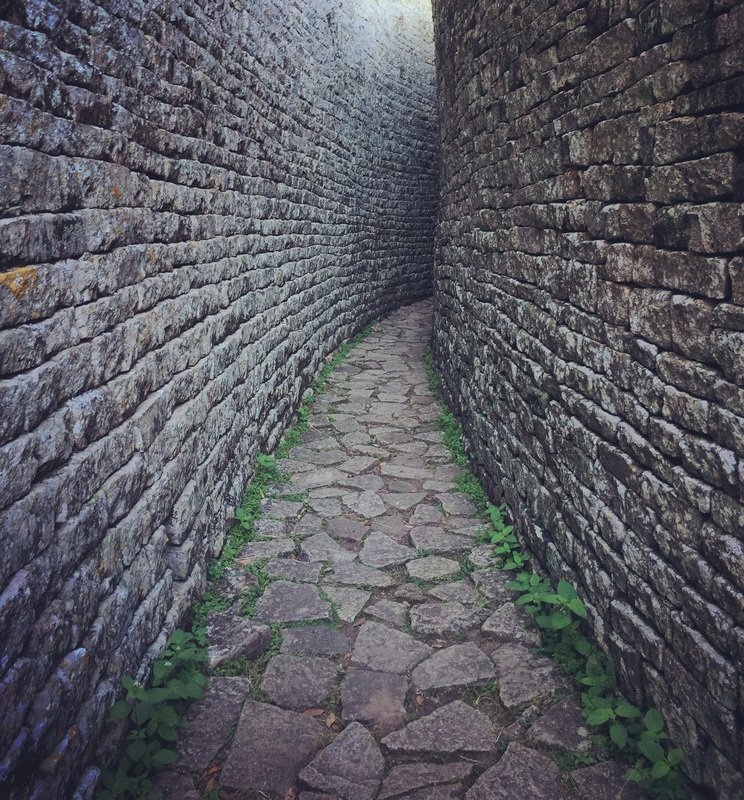 I remember going through the secret passage in the Great Enclosure and wondering out loud, ‘if only walls could speak,’ then all the gaps of time and decay could be filled with stories of what Great Zimbabwe once was.